It’s the most wonderful time of the year! The National Network of Abortion Funds Bowl-a-thon is here! Every April, we bowl to strike down barriers for abortion by raising money for our Women in Need fund. The Women in Need fund provides folks coming for abortion care with financial help for medical services, transportation, motels, childcare or whatever they need to be able to come to the clinic. 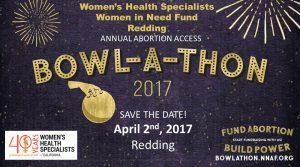 Save the dates and start donating/fundraising for Bowl-a-thons happening in Redding and Sacramento! April 2nd in Redding! Email dbrewster@cawhs.org for more details! April 15th in Sacramento! Email sdada@cawhs.org for more details!